Though I try to prevent my skin from going haywire with breakouts, sometimes I have to pull out the pimple treatments when those major breakouts occur. My arsenal of natural acne-prevention products is growing, and a new product I’ve added is Uncle Harry’s Colloidal Silver Blemish Roll-On. Made with acne-fighting oregano, tea tree oil and colloidal silver, Uncle Harry’s Colloidal Silver Blemish Roll-On is a powerful treatment that zaps zits; I used this on a few honkers (read: cystic acne and really big, red zits) and saw reduced size and redness in about two days. With that said, Uncle Harry’s Colloidal Silver Blemish Roll-On isn’t the perfect pimple treatment for me. I found the oregano essential oil to be a bit overpowering and irritating, and had to really be careful about not over-applying the treatment. My skin is not typically sensitive to essential oils (I can use straight tea tree oil on my skin without irritation; most people should dilute it with jojoba or another carrier), so I was surprised at my skin’s initial redness when I first used this. After playing with how much I rolled on, I found the right amount my skin could handle and was pleased with the results of this three-ingredient acne fighter. In addition to the skin-clearing powers of oregano and tea tree oil, Uncle Harry’s Colloidal Silver Blemish Roll-On harnesses the antibacterial powers of colloidal silver, a controversial yet popular ingredient in green skincare. I’ve called attention to this ingredient before and there’s some great discussion about it in the community (and a lovely post from The Green Derm). As I’ve said before, I have no strong opinion on this ingredient and have used several products that contain colloidal silver. It comes down to a personal preference (and if you feel you see results from it!). For me, colloidal silver seems to work in harmony with other antibacterial, antimicrobial ingredients and can be a dream for acneic skin. 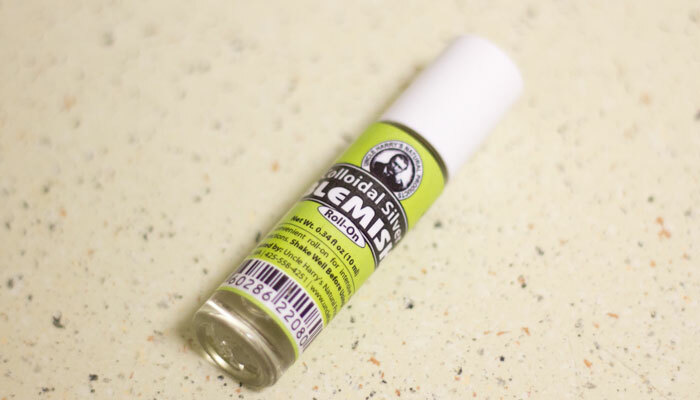 I’d love to see Uncle Harry’s Colloidal Silver Blemish Roll-On reformulated to include a few more soothing ingredients to counter to strength of the oregano; if there were a “gentle” version of this blemish treatment, it would be a repurchase for me! And I’m assuming for some of you out there, you’d want to see a version sans colloidal silver — though Uncle Harry’s would have to rename this product! Have you tried anything from Uncle Harry’s? What are your favorite blemish spot treatments? Tell me in the comments section!